All homes currently listed for sale in the zip code 85382 as of 04/23/2019 are shown below. You can change the search criteria at any time by pressing the 'Change Search' button below. "Panoramic views from this North-South facing patio on this extraordinary Westbrook Village home with a front veneer stone. This one-of a kind golf course beauty is loaded with custom design features, including an entertainment center, front plantation shutters, balsa wood blinds in kitchen, blackout shades in MB along with tons of little extras. Move-in ready great room plan with 3 beds & 2.5 baths. Vaulted ceiling and gorgeous manufactured wood flooring are a designers delight. Both bathrooms"
"PERFECTLY LOCATED, This HOME HAS IT ALL! 3100 square foot, 5 bedroom, 4 bathroom, meticulously cared for move in ready Fletcher Heights home. Beautiful shade trees. Versatile Bonus Room can be a movie room, game room or 6th bedroom. Who needs an RV gate when you can drive through the Garage into the Backyard storage area? Fresh neutral paint inside, New exterior paint. Newly Remodeled Master bathroom with tile and granite. Downstairs Bedroom with Full Bathroom next door. 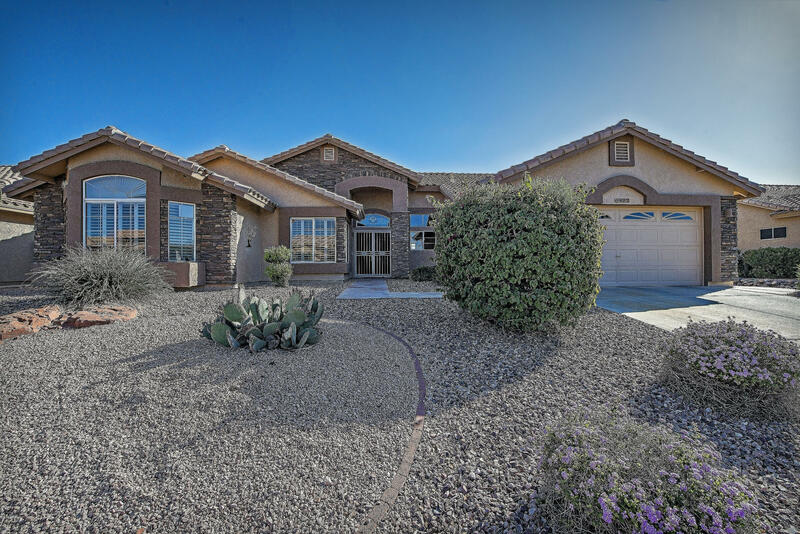 Resort style backy"
"This move-in ready home features 5 bedrooms, 3.5 baths and 2756 sq ft all on a single-level. Beautiful design inside and out with multi-sliding glass doors to the patio, an unforgettable kitchen that includes an oversized island. Impressive formal dining room. Split master suite. 5ht Bdrm has private bath- ideal for guests, office or multi-gen. RV enthusiasts welcome! 12'' RV gate. 8000 sq ft. lot. 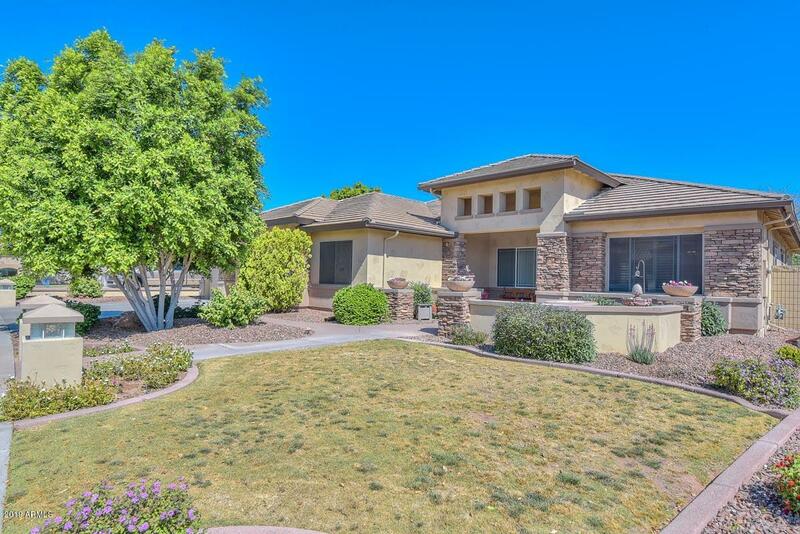 This quiet upscale community is nestled between walking trails and an orange orchard yet is mere"
"Amazing house in Fletcher Farms, awesome curb appeal with double door formal entry. Brand new tile floor. 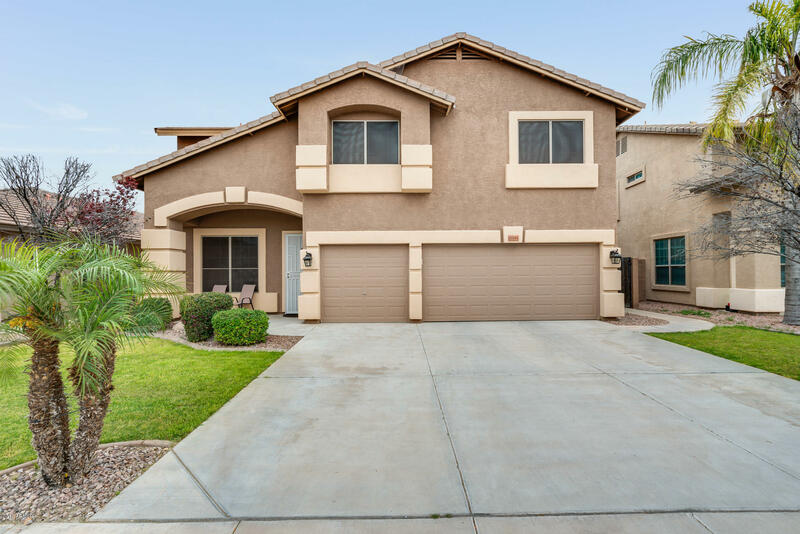 This beautiful 2 story offers 4 bedrooms with a loft upstairs and 3 bathrooms with a RV gate and plenty of room for parking. Spacious Kitchen with breakfast bar and dark cabinets. New paint down stairs. Backyard has covered patio with grassy area and mature fruit trees." "Upgrades! 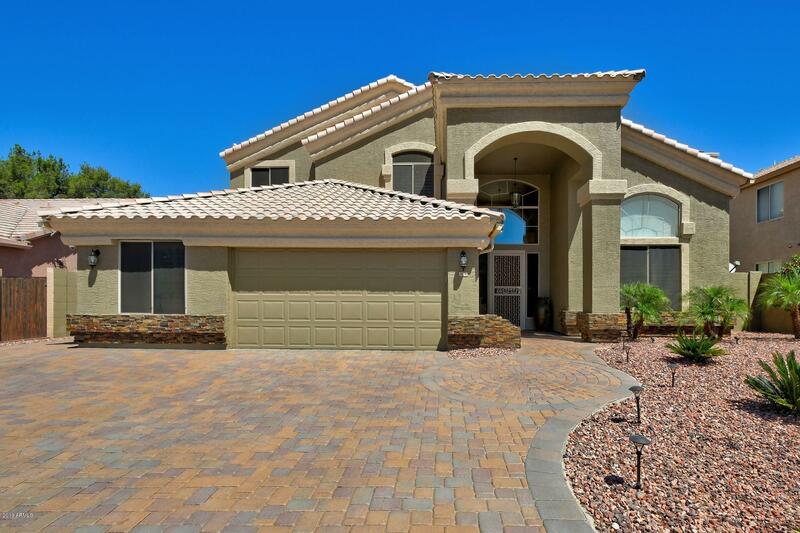 Spacious Entry 2 Lvng Rm/Dining Rm, Open 2 Den/Office all w/Shutters. 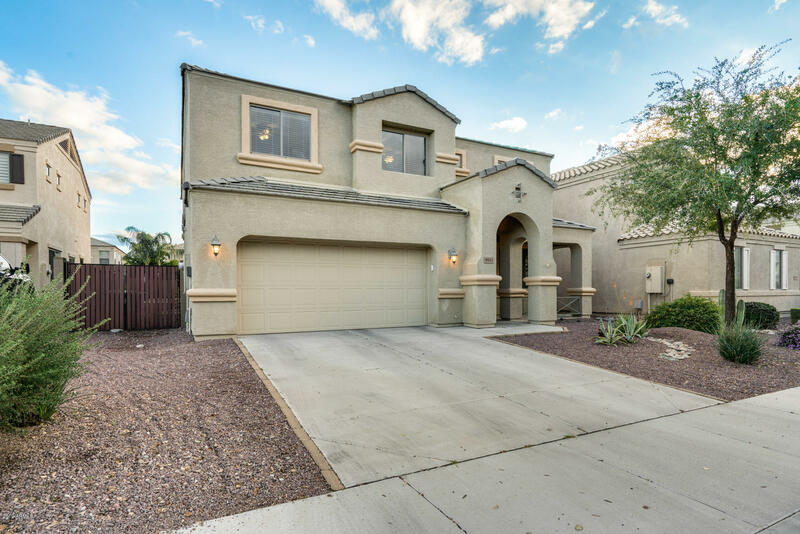 Tile leads 2 Gourmet Kitchen w/Lots of Cabinets, Arcadia 2 Patio, Granite Counter, Huge Island, Stainless Appliances, Open 2 Fam Room! 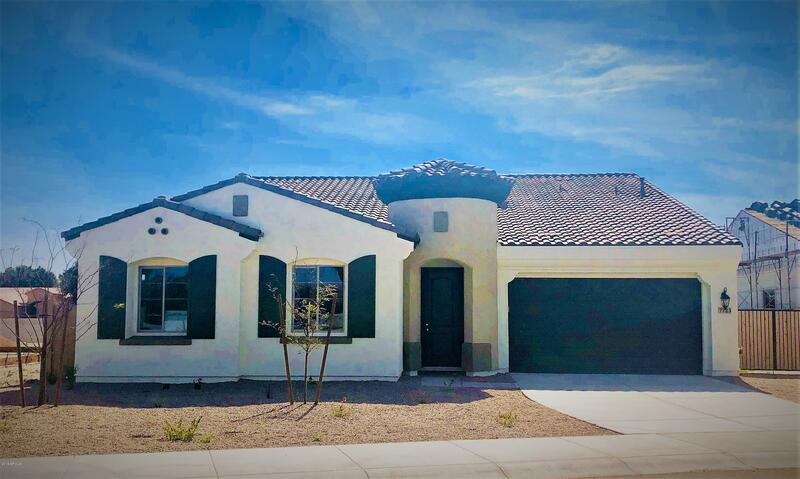 Double Doors 2 Spacious Master w/Arcadia 2 Patio, Master Bath w/Large Walk-in! Upstairs-Incredible Loft, Double Doors to 2nd Master Ste w/Full Bath, Large Walk-in. Bedrms 3 & 4 Spacious. 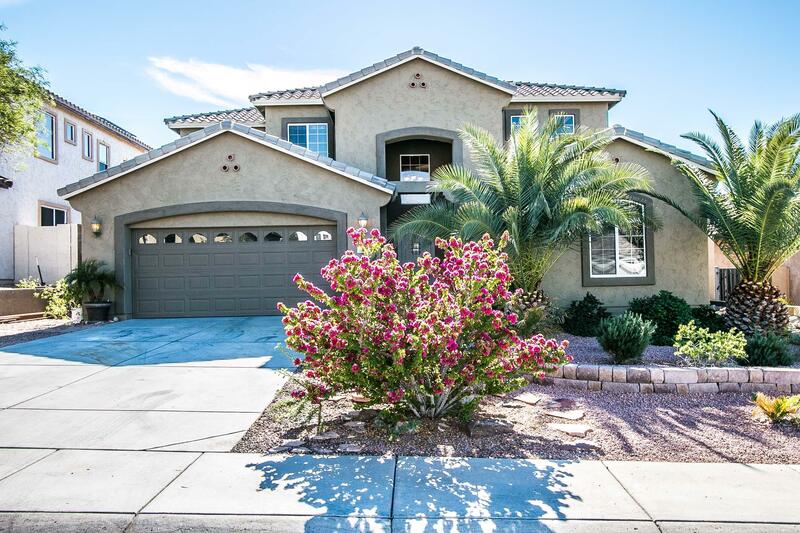 Outside 2 Yard w/Xtended Patio w/fans, Sparkling Play Pool, Gas BBQ, Surround Sound. Very Private!" "This is a must see! Beautiful move-in ready home or great opportunity for a rental property. 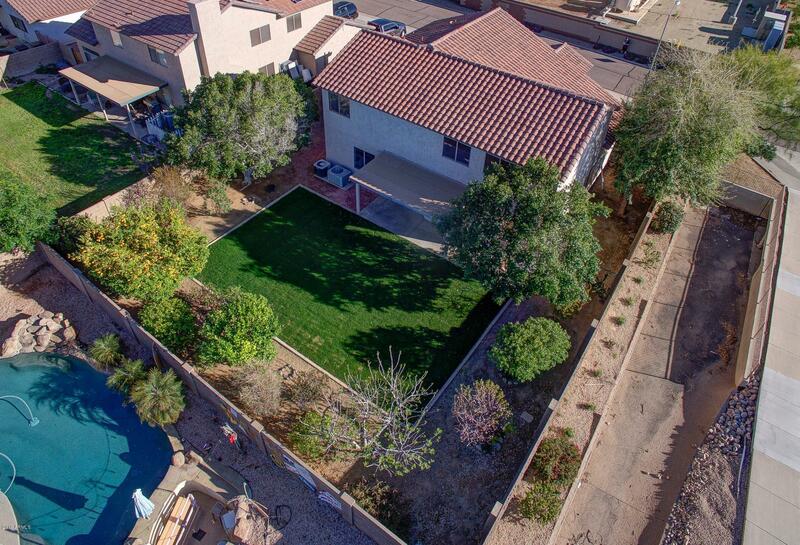 Amazing rear yard that includes a private pool & spa, gas fire pit, outdoor kitchen w/ tv, and it backs to a well manicured park with no rear neighbors. The interior offers 2 master suites (1st and 2nd level), 4 bedrooms total, 4 full bathrooms, stainless appliances, tile flooring, a gas fireplace, custom paint, wood shutters and updated fixtures. 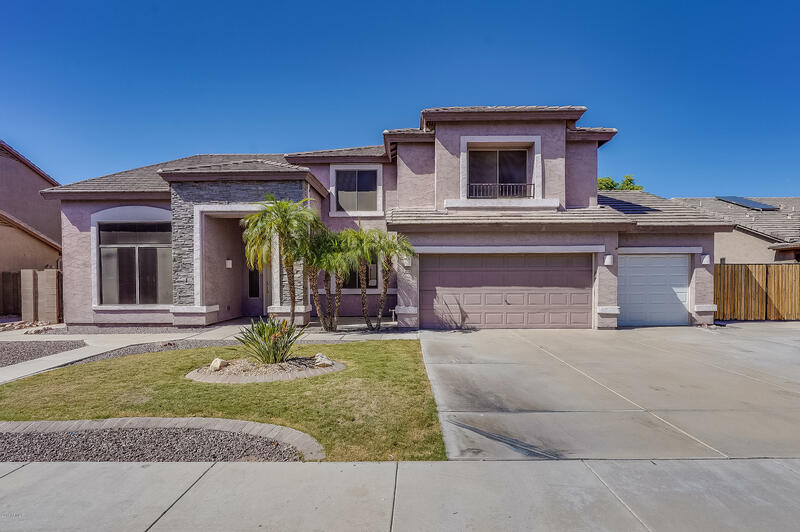 Other notable features include an entire home H20 con"
"Beautiful 2-story home featuring over 4,000 sqft of living space with 5BRs/3.5BA plus loft and swimming pool! Entry opens with vaulted ceilings, new two-tone paint throughout and a formal living and dining room. Large tiled family room with built in media niche. 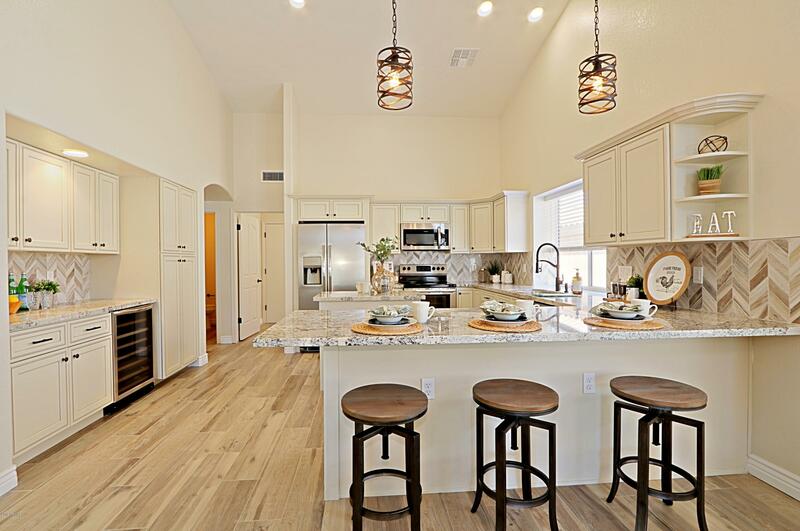 Kitchen boasts center island, NEW granite counter tops and NEW stainless steel appliances. A guest room with attached bath and bonus room complete the lower level. Large open loft is the perfect spot for play or entertainment area. 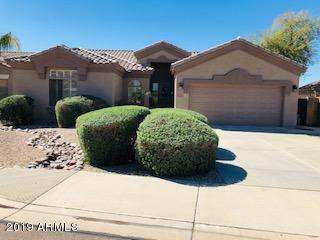 All b"
"GORGEOUS PEORIA HOME* SPARKLING PEBBLE SHEEN FENCED POOL WITH WATERFALL FEATURE & BEAUTIFUL HEATED SPA* GREAT CURB APPEAL* 3393 SQ FT* 5 BEDROOMS* 3 BATHROOMS* MOTHER IN LAW SUITE W/ FULL KITCHEN INSTEAD OF 3RD BAY GARAGE-CAN BE CONVERTED BACK TO 3RD BAY GARAGE* 2 LEVELS* BEAUTIFUL GRANITE KITCHEN COUNTERTOPS & BACKSPLASH* STAINLESS STEEL APPLIANCES* EAT IN KITCHEN* BRAND NEW SPA HEATER* NEW WATER HEATER(2018)* WATER SOFTENER* WATER FILTERING SYSTEM IN KITCHEN AND MOTHER IN LAW SUITE* DESIGNER C"
"Wonderful Vacation Home, Completely Renovated." "PRICED BELOW APPRAISED VALUE! 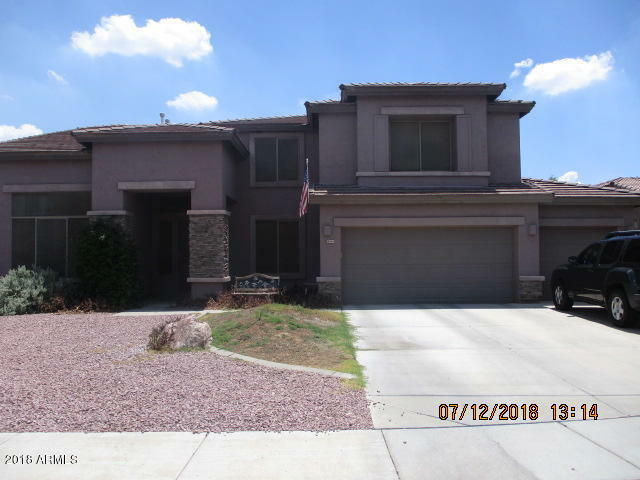 Beautiful 5 bedroom home with large 3 car garage and RV gate. This large open floorplan is ideal for entertaining. Downstairs includes a formal living and dining room, great room off of the large kitchen, and a large mother-in-law suite/office. Upstairs features a huge master suite with a cozy fireplace, his and hers walk-in closets and large bathroom with double sinks and separate tub and shower, large loft and 3 bedrooms. 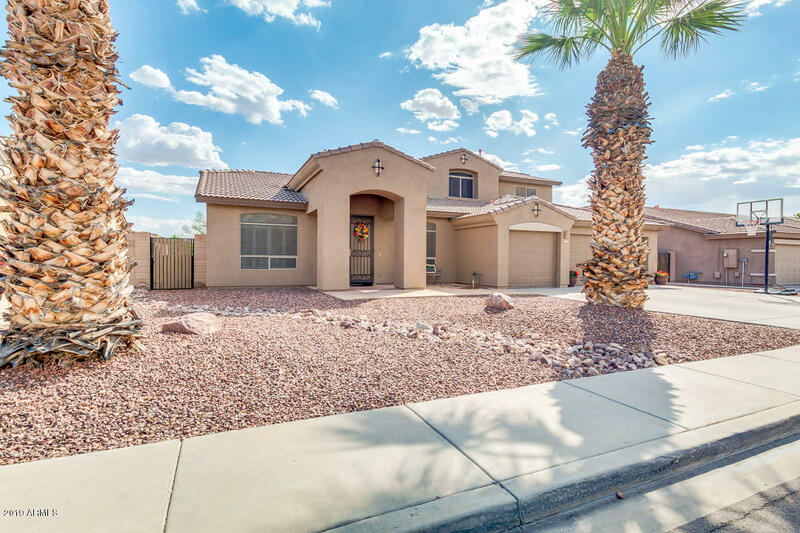 Huge backyard features a sparkling pool, l"
"Sparrow Ranch by Lantana Homes, nestled in a quiet enclave of 17 homes ranging from 2169-3439 sq ft; This home features 4 bedrooms with 2549 sq ft all on a single-level. Beautiful design inside and out with optional multi-sliding glass doors to the patio, an unforgettable kitchen that includes a double island. Impressive formal dining room. Split master suite and so much more! RV enthusiasts welcome! Opt. 12'' RV gates with no height restrictions, and optional RV pads and wash drains. 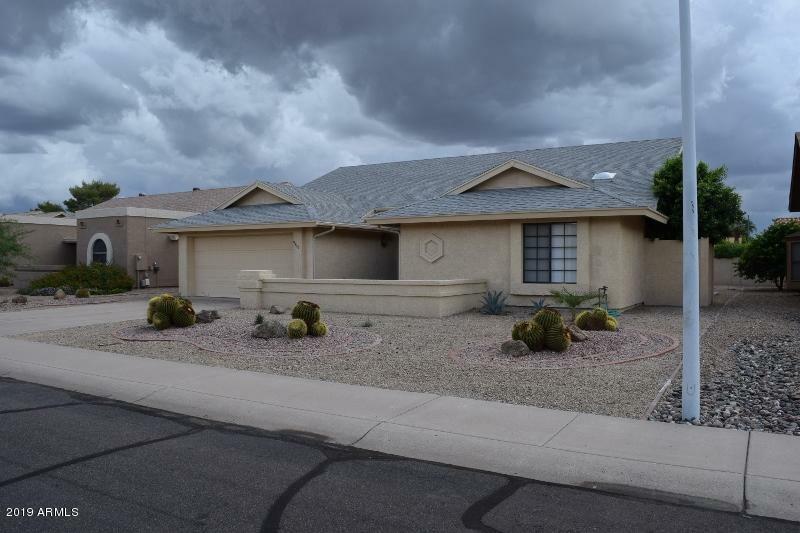 Lots range"
"Great Opportunity In North Peoria! Pride of Ownership. Attractive community where homes rarely hit the market. PRIVATE PLAY POOL, ext. covered patio, separate raised patio, gazebo, TANDEM 3CG, + RV Gate. Spacious floor plan perfect for all and entertaining, great room adjacent to large kitchen + dining nook, combination formal living and dining rooms, 5th bedroom downstairs w/ adjacent full bath. All 3 BATHROOMS RECENTLY REMODELED. Loft area + Separate Den, ( 5 Bed + Den ) and Generous size Ma"
"PROPERTY IS LOCATED CLOSE TO RESTAURANTS, STORES, FREEWAYS AND MUCH MORE TO LIST. THIS BEAUTIFUL HOME HAS 4 BEDROOMS, 3 BATHROOMS, LIVING ROOM, FAMILY ROOM, BEAUTIFUL KITCHEN, DEN AND MUCH MORE TO LIST. THIS IS THE PERFECT OPPORTUNITY FOR HOME BUYERS OR INVESTORS. THIS IS A SHORT SALE. LENDER APPROVAL REQUIRED. 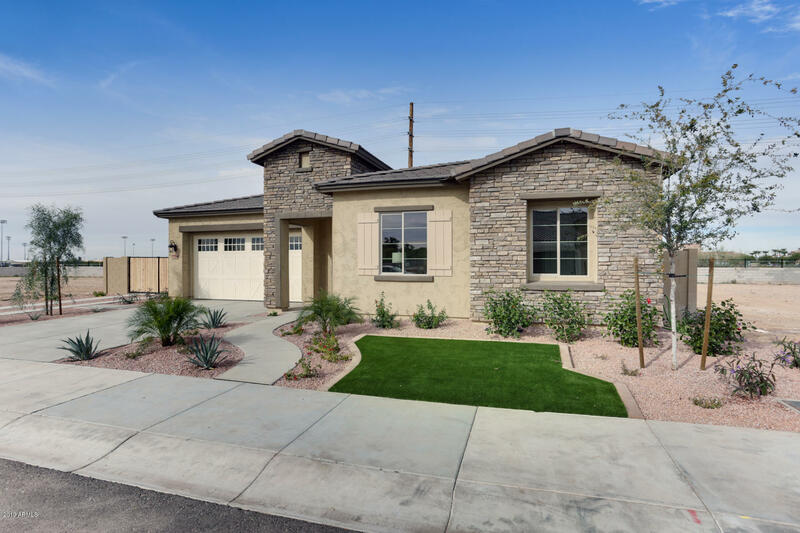 PROPERTY IS SOLD AS IS CONDITION"
"Sparrow Ranch by Lantana Homes, nestled in a quiet enclave of 17 homes ranging from 2169-3439 sq ft; This home features 4 bedrooms with 2169 sq ft all on a single-level. Beautiful design inside and out with optional multi-sliding glass doors to the patio, an unforgettable kitchen that includes a double island. Impressive formal dining room. Split master suite and so much more! RV enthusiasts welcome! Opt. 12'' RV gates with no height restrictions, and optional RV pads and wash drains. Lots range"
"You can park your RV or boat here! NEW REMODEL BY GEN. CONTRACTOR on a large corner lot. New Flooring throughout! Wood-look tile downstairs, Wood stairs & carpet in all the right areas. NEW Bright and Beautiful Bathrooms with brand new flooring, tile, counters and seam-less glass shower. Enjoy new SAMSUNG appliances in kitchen w/ New cabinets, granite counters & matching backsplash, while overlooking your grassy back yard & extra privacy mature trees. 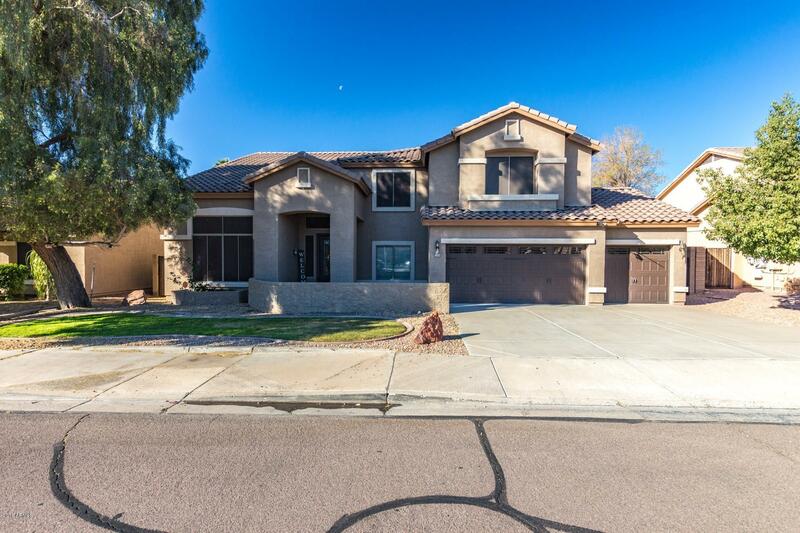 Breakfast and family area that provides a br"
"Beautiful North Peoria Home! 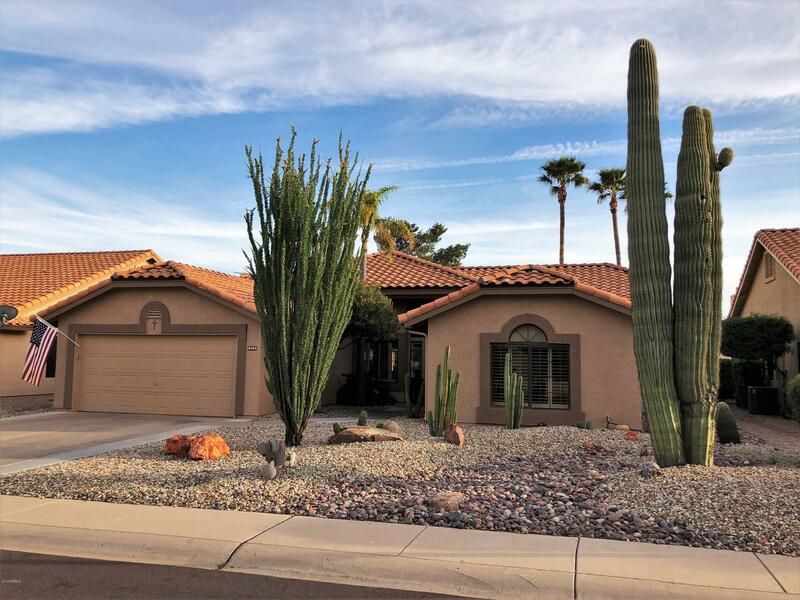 Located in a highly desirable Northwest community, this is the home you've been searching for!! 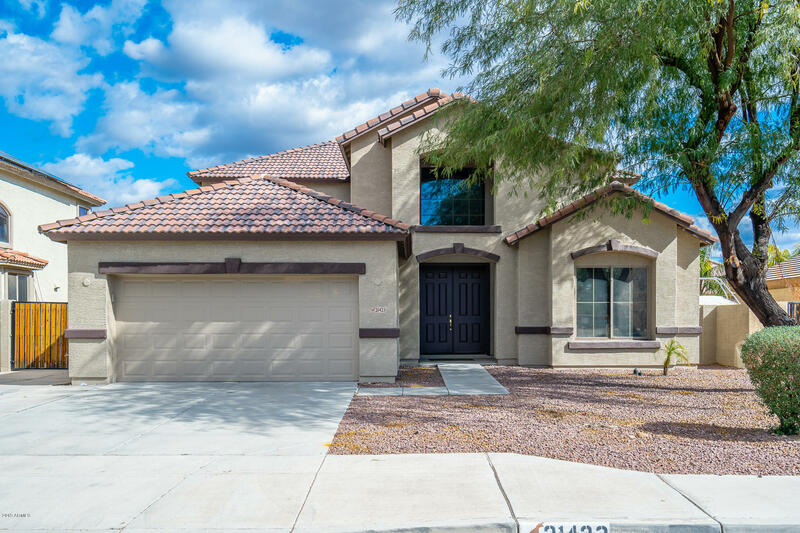 Gorgeous new wood look tile flooring throughout the first floor, a warm color palette, spacious formal living room, dining and family, plus a kitchen that is designed with the gourmet chef in mind. Rich wood cabinetry with 42'' upper cabinets, loads of counter space, an island and sleek stainless steel appliances. Upstairs you'll find new wood flooring in the generously si"
"Absolutely stunning single family home with 3-car garage, mature landscaping, a charming front porch, gorgeous stained concrete flooring, tall baseboards, an open concept floor plan, fully upgraded kitchen with white cabinetry, granite countertops, walk-in pantry, a kitchen island/breakfast bar and stainless steel appliances. There is interior laundry, there is a huge loft upstairs, spacious bedrooms and a huge master with a full en-suite bathroom and walk-in closet with built-ins. The backyard "
"Original owner, well kept! 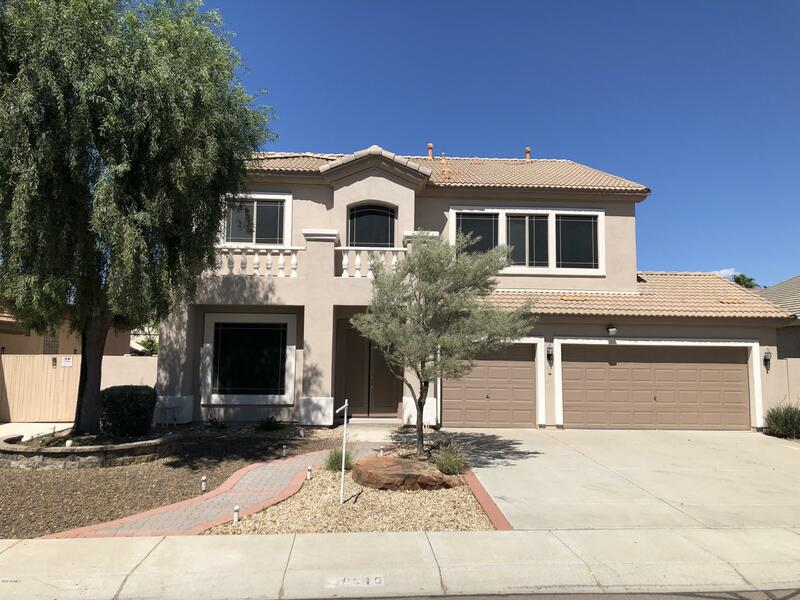 Long list of upgrades through out the home; Beautiful tile flooring, wood shutters, corian countertops, brand new stove in kitchen, fans in bedrooms, double doors to balcony upstairs, extra large size master bedrm, extended patio.... Home is spotless, light and bright. The loft area upstairs could be the 5th bedroom. 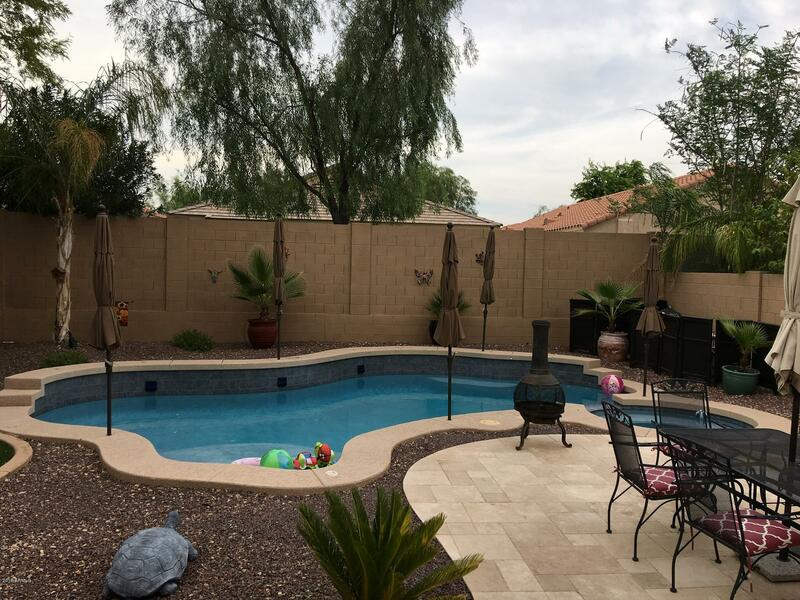 Good size pool in the backyard with waterfall , fully landscaped, with extended patio would be perfect for your family and friends weekend gatherings. 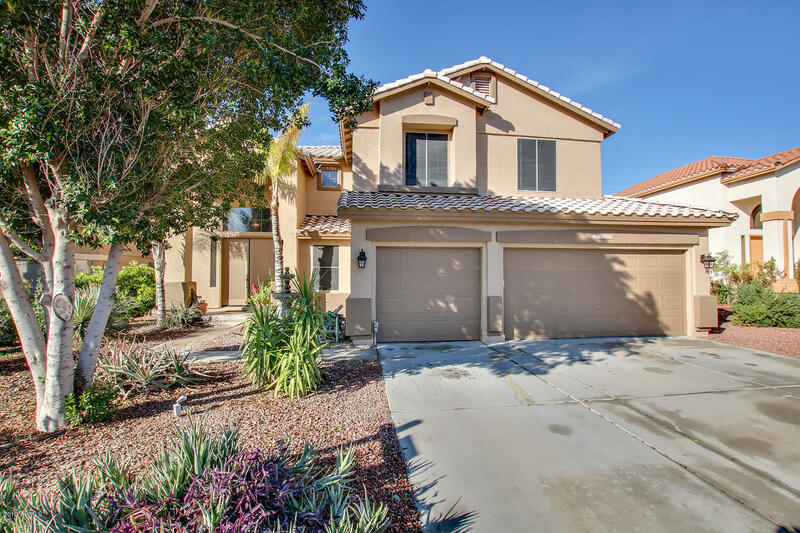 Buy"
"Stunning remodeled pool/spa home with 5 bedrooms and 3 full baths- 1 bed and full bath downstairs. Oversized double door entry invites you into soaring ceilings with newer paint throughout, updated tile floors and baseboards downstairs, newer white kitchen cabinetry with hardware, upgraded granite, stainless appliances, 2 pantries and expansive kitchen island with storage overlooking the family room with surround sound and fireplace. Updated vanity and fixtures in the bath downstairs. Upgraded "
"All the bells and whistles here! 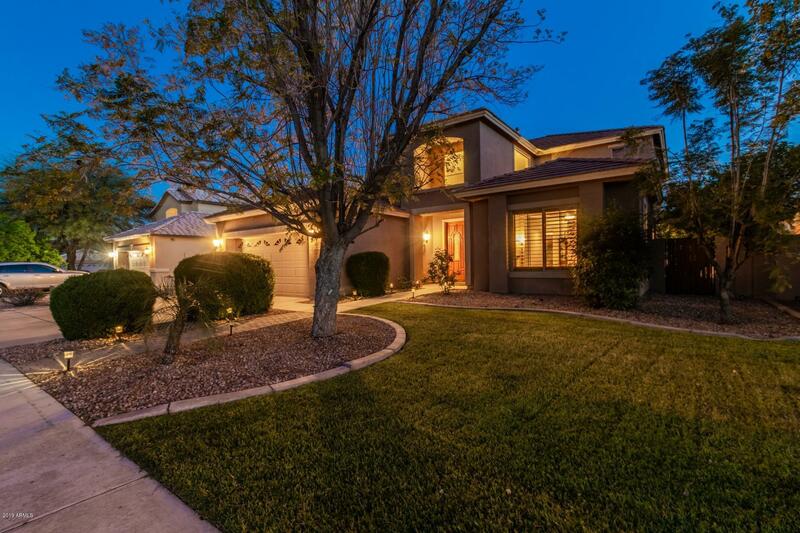 This stunning home in a cul-d-sac w/green belts is within 1-2 blocks to the park/library & elementary school. Features include: Shasta 4 yr new heated pool & spa **500sft travertine extended patio/covered patio**artificial grass play area**Granite slab countertops**mosaic tile backsplash**maple cabinetry w/crown molding/knobs**tiled flooring/laminate flooring**travertine doorway**R/O**reclaimed wood accent wall**shutters t/o**granite/backsplash upgraded mirrors a"
"Amazing location and oversize lot in a beautiful community that is close to dining, shopping, golf & entertainment! Spacious 3-car tandem garage. 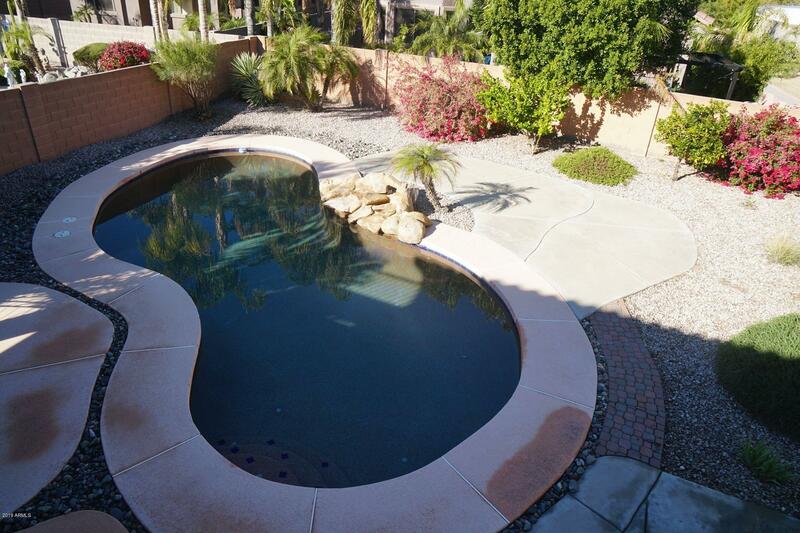 You will love entertaining in the spacious backyard with ample hardscape and a pool. Convenient backyard master bathroom door access. The kitchen opens into the casual living space, perfect place for family and friends to gather. Fireplace in the Master Retreat for a relaxing end-of-day escape, large tub, double vanities and walk-in shower! Spacious be"